Ever since they were little girls and witnessed their first marriage at the Plaza Hotel in New York City, best friends Olivia ‘Liv’ Lerner (Kate Hudson) and Emma Allen (Anne Hathaway) have been planning every detail of their own future wedding. Despite Olivia and Emma’s different taste in weddings they’ve always shared one specific detail – they both want to get married at The Plaza Hotel. Because of this central location, many sites from Bride Wars are featured on the NYC TV & Movie Tour. After their boyfriends (Chris Pratt and Steve Howey) propose to them over two days, they decide to schedule a meeting with the famous wedding planner Marion St. Claire (Candice Bergen). One meeting later, two different weddings and two different dates were now set at the Plaza for Olivia and Emma – a dream come true. But that dream is soon to be crushed – due to clerical error, they are no longer having two different weddings at two different dates, but are now scheduled to have their weddings at the same day, and the venue’s next open date is in three years. After a small misunderstanding, the two best friends are now doing everything in their power to sabotage each other’s weddings. Even though the movie takes place in New York, the filming was actually split between New York and Boston. But here are a few location spots that are worth checking out! When they first found out about the wedding planner’s mistake, there was still a small chance that they could have the problem fixed; if they could convince the third bride-to-be to switch dates with either of them. The shopping mall they are trying to convince her at is Bloomingdale’s, at 1000 3rd Avenue and East 59th Street, Manhattan. Since Olivia is a successful lawyer, a lot of her scenes takes place at her workplace. As you probably can tell by all the skyscrapers outside of her office window it’s located somewhere in Midtown – which is correct! The exact address is 1211 6th Avenue, Manhattan. Emma and Fletch shop for wedding bands in the Diamond District on West 47th Street, between 5th and 6th Avenue. The one and only Plaza Hotel. Located at 750 5th Avenue and Central Park South, Manhattan, and a location on the NYC TV & Movie Tour. In the middle of the fight Emma bumps into Nate, Olivia’s brother, on the street between 72nd Street Subway Station and West 73rd Street. This romantic comedy from 2009 by Gary Winick premiered in New York City January 5th 2009. In 2009, Anne Hathaway won the Teen Choice Awards for best Choice Comedy Movie Actress for her character Emma Allen. The rest of the cast has also been nominated in Teen Choice Awards, and the MTV Movie Awards. 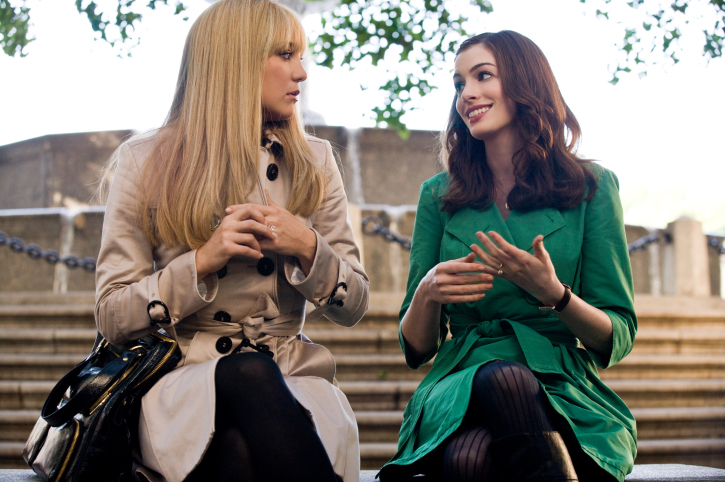 Bride Wars was nominated in 2010 for Favorite Comedy Movie.